A Basic Training workshop was organized by LEF for the members of NADRA Employee’s Union in Lahore. Farooq Tariq, Khalid Mehmood and Niaz Khan were facilitators for the workshop. Farroq Tariq analyzed the current political, economic and social system prevailing in the country. He said the Government is spending madly on defense army and on paying the foreign loans while it is ignoring aspects of Education, Health etc. The Army on the other hand is involved in politics and business. They have established institutions such as Askari Cement, Askari Bank and Askari Shoes etc. He said that they should work for the registration of the union from CBA, collect funds regularly and maintain their records. Khalid Mehmood highlighted the importance of unionization and unions. He said that in order to successfully negotiate for the rights the members and General Body of the union have certain duties and responsibilities. 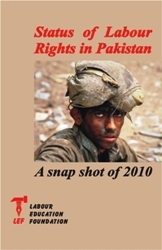 Niaz Khan discussed the overall situation of then Trade Unions in Pakistan. The struggle of Primary teachers’ in Khyber Pakhtoonkhawa regarding their service structure is on the verge of success as the Provincial Education Minister Sardar Hussain Babaik after negotiations with the All Primary Teacher’s Association has approved their demands. The teacher’s been on a strike since 1st October, 2011 and staged demonstrations, press conferences and seminars. A Basic Training workshop was organized by LEF for the Lady Health Worker’s in Karachi. Lady Health Worker’s recently registered their union with the assistance of LEF. The workshop discussed two themes, “Unionization and its importance” and “Responsibilities & duties of association’s officials”. Mushtaq Ali shan, Project Coordinator LEF stressed on the importance of union and said that unions strengthen the people and help them in achieving their rights. Project Coordinator Zahra Akbar Khan, talking on the occasion said that members of the union should have complete knowledge of the constitution. She discussed the roles of president, General Secretary, Vice president, Secretary Information, Finance Secretary, General Body and Managing Committee. Labour Qaumi Movement which originated in Faisalabad which is working for the basic rights, implementation of Labour laws and unionization in factories has branched out in other cities as well including Toba Tek Singh, Gojra, Kamalia and Jhang. After 8 long years the results have begun to arise as with each passing day the power loom worker’s are being provided with social security cards. As a result of this the membership of Labour Qaumi Movement is also increasing.